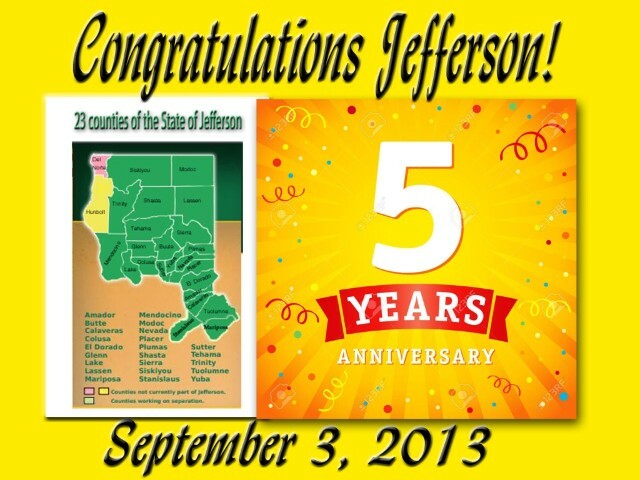 Thanks to the effort and coordination by Mark Baird, September 3, 2013, marks the date that the State of Jefferson movement officially got underway. That was the date the Siskiyou County Board of Supervisors (BOS) voted 4 to 1 to separate from the State of California to form a proposed State named Jefferson. The proposal was joined by Modoc County BOS, on September 24. Glenn County followed in January of 2014. It was Tehama County on July15, 2014, whose BOS voted unanimously to adopt a resolution supporting the declaration of withdrawal from California based on an advisory vote taken on a June ballot where the public voted 56% to 44% in favor of splitting the state. On July 22, 2014, the BOS of Sutter County unanimously adopted a resolution supporting a declaration and petition to the Legislature to withdraw from California to address a lack of representation. On October 24, 2014, Modoc and Siskiyou delivered their declarations/petitions to the California Secretary of State. This was followed by eight counties on April 1, 2015. January 6, 2016, was Declaration Day at the West Steps of the State Capitol when other counties filed their declarations/petitions, bringing the total to 21 Jefferson Counties seeking representation and/or to separate from the State. This year, Mariposa and Siskiyou Counties will be filing their declarations and giving us a new map with 23 Jefferson Counties. Think back to those years, 2014-15, when each of us were out gathering signatures on support statements to gain the numbers needed to file declarations/petitions, seeking equal/fair representation and/or to separate from the State. Remember Declaration Day, when bus loads and car loads of Jeffersonian's from 21 counties showed up at the capitol with our flags and signs celebrating this momentous day just a little over 2 years after it all began. This is also the day that we filed into our elected representatives offices dropping off information and talking to their staff. Unfortunately, all this fell on deaf ears. A year later, a new effort got underway when on May 8, 2017, Citizens for Fair Representation (CFR) filed a lawsuit against Secretary of State Alex Padilla for lack of representation and dilution of vote not just for Jeffersonians but for all citizens of California's 58 counties. When CFR is successful, this will be history in the making that could also affect representation in about 30 other states. It is time to hit the reset button to expand and strengthen our base, to support Jefferson and join the battle for equal/fair representation in the State Legislature. Yes, the support for Jefferson and recognition about the imbalance of representation has grown, but there is still much more work to be done. We are asking that all in the 23 counties hit the reset button and put forth a huge coordinated effort to hand out brochures, enter into dialogue and secure signatures on support statements. The forms should include a space for individual's name, phone number, email address and signature. Remember any age can sign the forms and you do not have to be a registered voter. This is also a great way to add contacts to your county email data base and also add subscribers to the Jefferson Messenger. Jefferson and Citizens for Fair Representation is about the future of our children and grandchildren. We want to give all a voice in their future that includes their education, livelihood, health and safety and governing of the new state not to mention even naming their state. It is and always has been about representation. Too many in your local communities are not aware of this and how far we have come. They don't know that Citizens for Fair Representation has a case in the United States Federal District Court in Sacramento. Unfortunately, the federal judge and Ninth Circuit have failed to appoint a three-judge panel to hear CFR's case. It seemed only fitting that on the day we celebrate our nations independence, July 4, 2018, CFR's attorneys filed a Writ of Mandamus with the United States Supreme Court asking the court to compel the District Court and Ninth Circuit to impanel a three-judge court. Just three weeks later on August 27, SCOTUS issued a docket number. Last month, we passed the half way mark in our goal of $1 Million for the State of Jefferson Formation Legal Fund. Every dollar counts and is so appreciated. Some counties have had fundraising dinners, dessert auctions, yard sales and ice cream socials. The size of the event does not matter. It is a great way to get the word out about Jefferson that can include activities and fun for the whole family while also raising funds for the court case. Get to know your local business people and ask them to donate gift certificates or goods and services for opportunity drawings. Gun and ammo store owners will usually work with you for more high dollar drawings. Reach out to other county committees and seek their advice. Start coordinating with your neighboring counties for town halls special meetings and events. This election year gives us the platform to market Jefferson. Set up a table at a Wal Mart or other local markets for signature gathering and even registering voters. Tell people Jefferson through CFR is fighting for you to have a voice. If they want change in California and to have a say, then use your voice where it can count and vote on November 6. Talk about the gas tax, fire tax, water rationing and sanctuary state. You will find that most people are as angry about what is happening in California as you are and they welcome venting to like minded people. The fix is representation that can also take us down the path to a new state. We urge all county committees to look at someone in your group that will take the lead and coordinate volunteers, to find locations and gather signatures. Perhaps another to coordinate sign and flag rallies on local roadways, business districts or freeway overpasses. Visit other local club or group meetings, Chamber of Commerce meetings and youth groups. Perhaps they might allow you to do a presentation and set up a booth while also supporting their efforts. We are grateful to have the team of people throughout the counties of Jefferson who have contributed so much of their time, dollars and been the brains behind so many great fundraising and marketing efforts. We have had individuals who have offered to match donations in the thousands of dollars. We have indeed come far since 2013 and I wonder how many of you recognize what has been the biggest bonus for all of us over these last five years. Jefferson has brought us friendships that have not only formed in our own counties, but have stretched across county borders. You are all patriots but our battle for liberty has yet to be fully won. Therefore we ask once more that you give a little more of your time, share your ideas and reach out to others to help grow and strengthen our base. Jefferson is growing and twenty-three counties strong. Jeanette Finicum, widow of Robert “LaVoy” Finicum, will be the guest at the SOJ Patriot’s meeting on Monday, September 10, located at 2570 S Bonnyview Road in Redding. The meeting begins at 5:30 PM. Robert “LaVoy” Finicum was shot by officers of the Oregon State Police and/or FBI as he was trying to drive “across the county border” to seek the protection of the Grant County Sheriff. The Finicum family claims Robert was shot “assassination style” by officers. Finicum was a spokesperson for Citizens for Constitutional Freedom, who it's claimed “seized an armed occupation of the Malheur National Wildlife Refuge in the State of Oregon. The Hammond's, who were recently pardoned by President Trump, were arrested in connection with the incident at Malheur. This year, the Finicum family filed a wrongful death lawsuit against the FBI, BLM, Oregon State Police and others. The case is still pending. Members of the Mariposa County Committee are offering to Match $2,100 for the State of Jefferson Formation Legal Fund. You can donate any dollar amount which they will match up to $2,100. 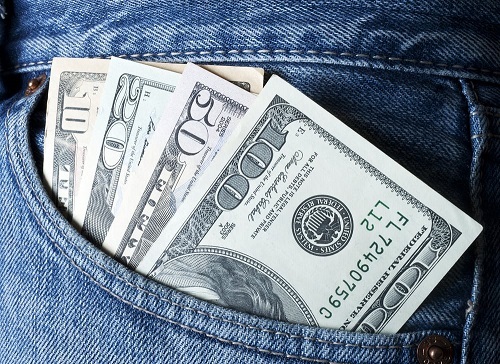 Therefore, your $5 will become $10 or your $20 will equal $40 donated to the legal fund. Please send your checks to State of Jefferson Formation, P.O. Box 751, Palo Cedro, CA 96073. Checks must be made out to State of Jefferson Formation and check memo must read MATCH. These donations are not tax deductible. We thank the Mariposa County Committee for this generous contribution. SOJ's Mark Baird will be the guest on Jefferson State of Mine on KCNR 1460 radio this Sunday from 9 to 10 AM. Mark joins co-hosts Terry Rapoza and Win Carpenter, who will be talking about the latest updates about CFR's court case along with other Jefferson news and events. From 10 to 11 AM also on Sunday, tune in to the State of Jefferson Hour on KAHI 950 AM or 104.5 FM radio. This weeks special guests are Assemblyman Travis Allen and Steve Franks, writer/publisher of California Political News & Views, an online and email newsletter, who has the pulse on the political scene in California. Both shows are live talk shows and callers are welcome. If you are not in the stations listening range, you can listen to the shows on your computer. Both shows are archived on Podcast.